Feel the breeze off the Savannah River and follow the smell of hot pralines all the way down River Street to the iconic Waving Girl statue. 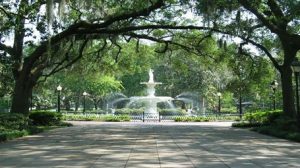 History comes to life in Savannah’s National Historic Landmark District, with its picturesque network of squares and charming cobblestone streets. Tybee Island is a 20-minute drive for quiet time on the beach and breathtaking coastal scenes. Whether you’re planning your first trip to Savannah or your 10th visit, we hope you enjoy every moment in this stunning city! Your bedroom serves as your rolling hotel for the entire nine day trip. All meals and beverages included while the train is enroute. Off car excursions, meals, and gratuity for your onboard staff are not included in pricing.